Congratulations to Rutgers Nursery & Landscape, who wowed our judges with timeliness and shopability  making them Lawn & Garden Retailer’s 2011 Merchandiser of the Year. Having the wherewithal to create a late summer buzz around leftover pottery, Rutgers Landscape & Nursery has what it takes to catch the collective eye of our esteemed judges panel and earn the title of Lawn & Garden Retailer’s 2011 Merchandiser of the Year, despite some pretty stiff competition  East River Nursery, Al’s Garden Center and Habersham Gardens. In addition, the competition’s sponsor Braun Horticulture will award the retailer a $250 Wholesale Gift Credit and a 15 percent discount toward Braun’s 2011 catalog offering  something the Rutgers team will work beautifully into displays and then undoubtedly sell the pants off of. Leslie Boss, Rutgers’ sales and customer service manager, explains merchandising is a team effort and no idea goes unheard. Boss was kind enough to share a few more of the Rutgers team’s merchandising tips with Lawn & Garden Retailer in a recent question and answer. 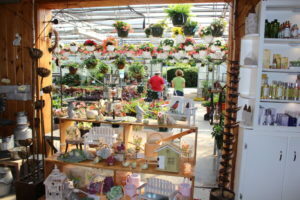 Lawn & Garden Retailer: Your winning pottery display was “smack dab in the middle” of your greenhouse. Do you take that approach with other displays? Leslie Boss: Absolutely! In fact we already have. We have two wonderful wooden displays that we stained brown to make the plants pop. We change them with new flowers that catch the eye. It’s all about color! We recently set up a fig, lemon and lime display (Figure 1) that is immediately in the greenhouse when you walk in. We are consistently changing out our displays in the front entrance of our store and nursery. There is never a week that goes by that we are not changing out the nursery stock in this center stage area of our nursery. L&GR: How are new merchandising ideas introduced at Rutgers? Boss: No idea is ever passed by, as we will discuss all new ideas. What has worked very well with us is to maintain a weekly marketing meeting between the nursery manager, operations manager, marketing manager and general manager throughout the year  including the busy season. We make time each week to sit down and discuss upcoming events and possible displays. Each manager has the opportunity to discuss what’s up their sleeve for the next project, display, marketing or increased sales idea. L&GR: How does Rutgers breathe life into slow moving products? Boss: We have tried bundling sales, but what seems to work best with us is the “Buy Two, Get One Free” sale. This works well with annuals and ground covers. We will often have this sale during the time that sales of any given item tend to slow down. Last year we started a “Free Cart.” It’s a customer wagon placed in some obscure area of the parking lot with a sign that says “FREE” in red letters. The items we put on this cart are just not looking that spectacular anymore. We’ve noticed the clientele that comes in to see what’s on the free cart will then come into the nursery to buy more of that same plant. L&GR: What about slow areas or displays  what’s your best approach to drawing some attention to it? Boss: Move it! It’s amazing what can happen when you move one item from the floor to an elevated area and vice versa. Move it to an entirely different area. Tell a story about it! Oftentimes, nurseries take for granted that their customer base knows what they’re looking for. If you tell a story, explain the item, give them information they might not know about it, then they’ll be more inclined to buy it. L&GR: Any new ideas you’ve implemented this year? Boss: Where do we start? To date, we have started a cross-merchandising program where we have contacted local businesses to display their items in the nursery that complement a landscape or garden atmosphere. We are in the process of building a large fireplace in the nursery that showcases what can be done in a customer’s home with an outdoor fireplace, which incorporates plant material around it. We also had a potting shed built in the main area of our pottery displays, which our customers can use to pot up their own containers, or we can pot them up for a fee. We recently had a “Planting Party” workshop, which not only was a huge success, but the following day customers were coming back in with their other containers, buying plants and potting them up themselves, simply because there was no mess at their own homes and they were afforded an area here to do this. Doorbusters is another sales/merchandising strategy we use here at Rutgers. It’s when we bring in a plant that a grower has that looks spectacular, but they may be long on and willing to give us a special deal. We place it up front, massing the plant and offering it at a very low cost, maybe $2 more than what we brought it in for. It works! [At the time of press] we are doing 11-inch lantana baskets. 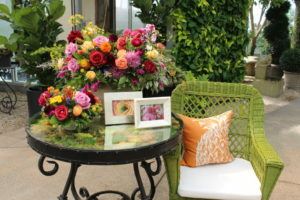 And I can’t forget to mention our famous chairs and our even more famous Knockout Roses. We have Knockouts lining the entire entrance of our nursery (Figure 4). We get many calls from passersby asking us, “What is that wonderful plant you have in front of your store?” Against the yellow chairs they are the perfect contrast! We sell hundreds of knockouts every year because of this eye catching display out front. Lawn & Garden Retailer would like to thank all of our judges  Shanan Molnar, GCA; Marshall Dirks, Proven Winners; Sue Di Staulo, Braun Horticulture; Faith Savage, Syngenta Flowers; and Sue Amantangelo, Home & Garden Showplace  for taking the time to share their experience and expertise and choosing a winner for this year’s competition. An additional thanks goes out to Braun Horticulture for sponsoring this year’s contest and recognizing the importance of promoting and encouraging creative and successful merchandising practices.